This level has medium difficulty. For this level try to play more near to honey blockers or make special candy as you get the chance. 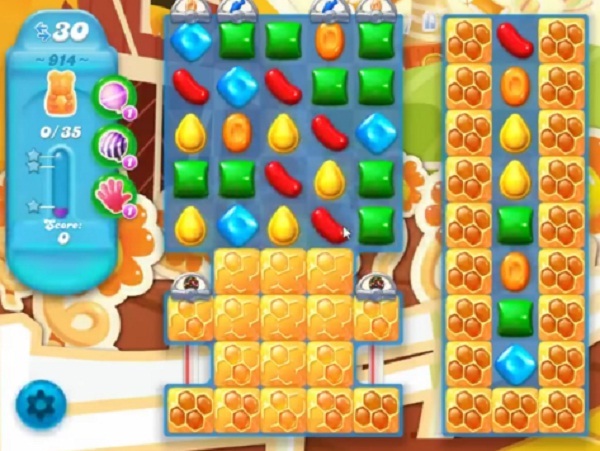 Combine them with each other or use striped candy with other special candy to break the honey blockers that are in corner part of the board. This level is really hard for me I would Appreciate it if you can help me cannot get any Special Candies to Combine and Break Blockers Thank You So Much I’m STUCK on thus one can only save 18 bears and I’m out of moves..
My versio has licorice whips in right column. Much harder!!!!! My version has licorice in the right column also. Not having any luck at even getting close to completing this level. I have licorice down right side your examples do not . Can they be changed please ? Why don’t you reply I have licorice swirls on the right hand side. Update your video to show this. Thxs.